Take part: learn and be heard! Taking part in the events during Climate Week will help you become aware, and hopefully inspire you to become a change maker. And then talk about what you think, see, and feel. And keep on talking and listening with different people until change happens. Change small things you do every day. Think about whether you can do things smarter, using less energy, or wasting less. Show your friends that other ways of doing things are often more fun and better for you as well. Write to your politicians and help them to act. Aberdeen Climate Action organises a monthly Climate Cafe for discussion, and also possibly film showings. Want to help? Or join? Contact us at: info@aberdeenclimateaction.org. Interested in Politics? Get Involved! Powering Aberdeen is Aberdeen’s first Sustainable Energy Action Plan (SEAP) as required by the European Union’s Covenant of Mayors (CoM) initiative. 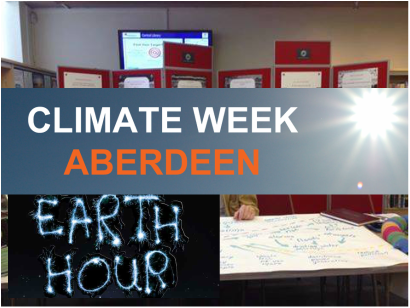 It is a key document that outlines Aberdeen’s aspirations to reduce emissions and establish alternative forms of energy; aligning to the principles of Earth Hour. It is a major strategic programme that forms an important part of the development of the North East of Scotland. Powering Aberdeen covers Aberdeen city, however its implications are transboundary. As such it is recognised within the Aberdeen City and Shire Strategic Development Plan and forms part of the North East Sustainable Energy Action Plan as led by Aberdeenshire Council. It is hoped that through implementation of the action plan, Aberdeen will start the journey towards an economic, social and environmental transformation covering many themes such as energy, water, waste, transport, construction, planning, health and wellbeing. Working with multiple stakeholders including citizens, businesses and the public sector, they will be empowered to make informed choices regarding their future. Whilst energy is the key driver of the CoM it is important to acknowledge the wider significant benefits Powering Aberdeen will bring, including those upon the economy, market diversification, health and wellbeing, innovation, research and development and city resilience to a changing and uncertain future. Powering Aberdeen will provide the political commitment, leadership and planning necessary for a low emission Aberdeen; reducing the city and region’s dependence upon finite resources and diversifying the energy mix. This delivery model will seek to utilise existing policies, plans and strategies through collaborative partnerships to ensure actions are delivered. By taking such a holistic approach it is envisaged such thinking will be integrated into actions spanning themes such as planning, construction, transport, waste, energy, health and wellbeing. It is recognised that Powering Aberdeen is ambitious. However, the proposed action plan has been identified by recognising best practice across other European cities and learning from others in their attempts to succeed. It is hoped we can build upon this expertise. How will the climate change in Aberdeen? Recent impacts from high rainfall and flooding in the region have shown how severe weather is affecting the region. Climate change projections indicate these weather incidences will increase in frequency in the future, with warmer winters and an increase in winter rainfall intensity; hotter, drier summers; and a rise in sea level expected. Demonstrating commitment to addressing climate change, Aberdeen City Council is part of a risk task team working with Adaptation Scotland to develop a public bodies approach to assessing climate risks. Climate change presents significant implications for Council services and operations, bringing both threats and opportunities. This will include direct and indirect impacts on buildings and infrastructure, the natural environment and society. Taking a cross-service overview of climate risks will help to assess vulnerability and help examine how to manage risks and build resilience to future extreme weather. The work is taking place as part of wider adaptation planning for the city which aims to build capacity and resilience and ensure statutory obligations are being effectively met. The approach will require a shift from short term decision making based on the experiences of current weather, to one that considers the future climate. Measures include integrating adaptation into decision making to address climate change issues.